As stillwater flyfishers we know that the late summer heat of August has forced the trout to murky depths and made them too lethargic to chase any offering we present. It is at this time that we pursue other recreational interests while we wait for water temperatures to cool down in mid September and bring on the fall fishing season. 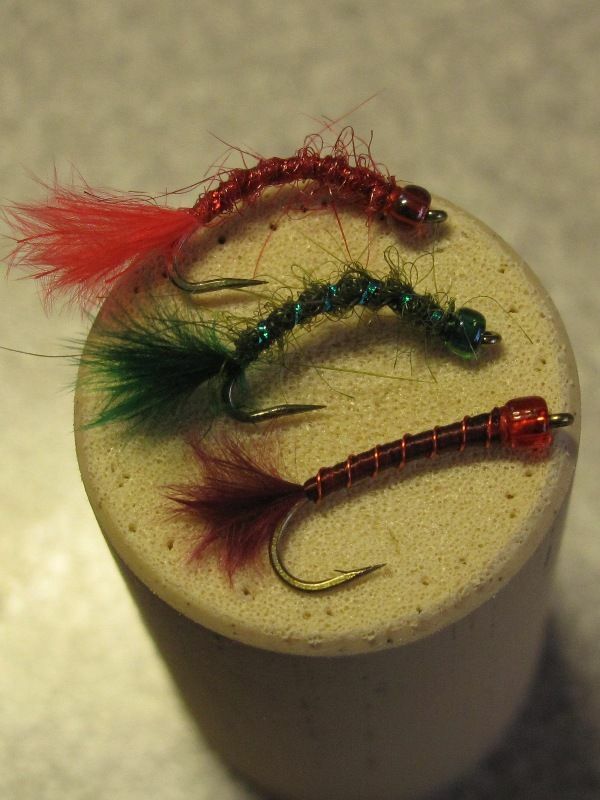 However there is an exception to the rule … fly fishing bomber chironomids! 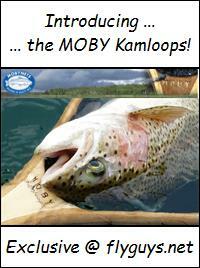 Of course the rivers offer exceptional fishing at this time but we will stick to either stillwaters or bust! So the options are slim. You can step outside your comfort zone and go to lakes at much higher elevations and usually smaller fish due to a shorter growing season or you can ply your usual haunts with Hi-D lines and dredge the depths early morning and late evening for the few cooperative fish that might engage you. For those unaware, there are a handful of lakes in the Southern Interior that explode to life from mid July to late August when surface temperatures are close to busting through the 70F marker. A couple of the lakes in question are Minnie and Stoney on Douglas Lake Ranch, Hatheume Lake, just off the Kelowna Connector on the Merritt side and Tunkwa/Leighton perched upon the Thompson Nicola Plateau. And what could possibly be hatching at this time of the year to bring the fish out of the comfort of the cool depths? Bomber Chironomids! They are called that because of their size compared to standard chironomids that emerge in such great numbers in the spring and to a lesser degree in the fall. The stillwater standards ranging from size 18-12 are on a one year life cycle whereas bombers take two years to emerge into adults. 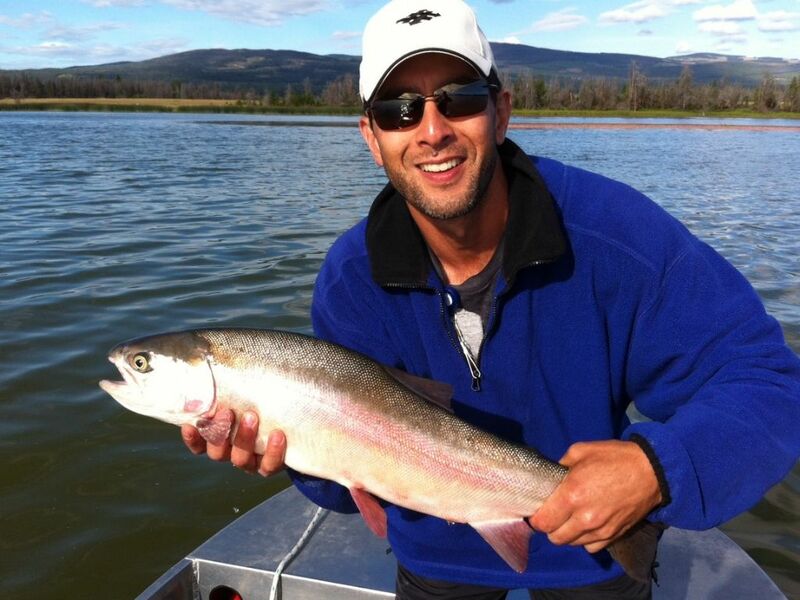 The first bomber chironomid hatches of the summer occur at both Minnie/Stoney and Hatheume as well as a few other lakes that are unmentioned here but I will concentrate on Tunkwa Lake as that is where the lion’s share of my knowledge resides having managed the resort from 1999 to 2008. Without exception this is absolutely the best time of the year to find the largest residents of Tunkwa cruising the bottom depths in 12-14′ of water looking for chironomids staging up for their emergence. At this time of the year Tunkwa has a maximum depth of 17′ which makes it very difficult for the fish to hide even if they wanted to which in turn makes it very easy for the flyfisher to locate them. Floating lines, indicators and 17′ leader setups are the way to go. Recommended rods are medium to fast action in the 5-7wt. class. Keep in mind that it is important to shorten the time of the battle and revive them to good condition before releasing. The warm surface temps can make a strong fish build up lactic acid quickly so stout rods are beneficial at this time of the year. When tying imitations of bombers you will want to cover a wide range of sizes from as small as size 12 1XS to size 8 3XL with the larger sizes being over an inch long. Big bloodworms work very well this time of the year as well and are best tied on size 12 3XL to size 8 3XL in reds, maroons and greens and believe it or not, combinations of these colours. 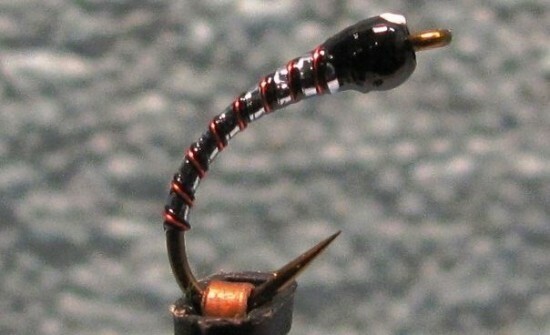 To complicate the tying even further you will want beadheads ranging from white to copper to brown to black and everything in between. Bead sizes should be 7/64th’s to 1/8th. 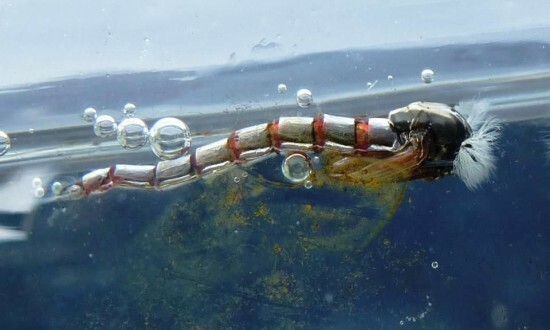 Coloured beads which incorporate gills tied in will have to be cast aside for either white beads or no gills at all if there is algae present in the upper water column. White gills are algae magnets and will throw the fish off of accepting your well presented fly. The saving grace of tying bombers is you will only find two main colours of naturals, browns and olives, but several shades of each colour. The best brown pattern I have found is dark reddish brown to match the naturals that are present every August, along with Summerduck or rusty brown. For olives I prefer dark olive patterns for Tunkwa but medium olive all the way down to chartreuse will work as well and then of course there are the very popular patterns that incorporate Anti Static Bag and Gunmetal Flashabou to simulate the gases the naturals collect under their cuticles to aid in their ascent to the surface. 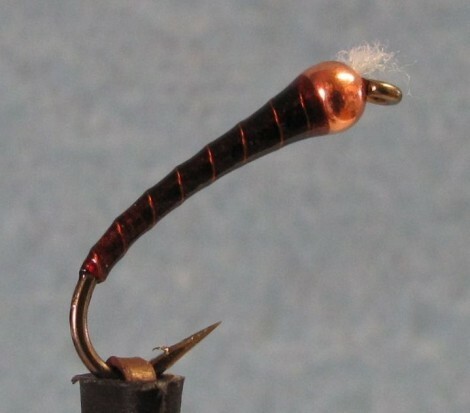 Well, I could go on and on about fly fishing Bomber chironomids but this is a good starting point and at the time of this writing (August 14th) the hatch should be in full swing so get out there and toss a line and try your luck. A big thanks to John Kent for sharing his article on flyguys.net! If you’re interested in any of John’s custom fly patterns you can contact him at jhn.knt@gmail.com. 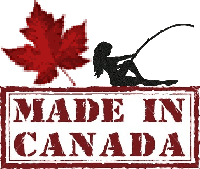 For more chronie fly fishing/pattern information check out our fly fishing chironomids page, and our chironomid fly patterns category! For more on overall still water fly fishing strategies please visit & review our extensive still water fly fishing category here! 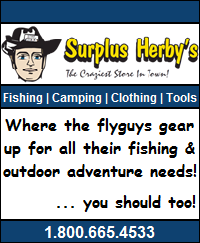 Fishing and fly tying ... it doesn't get any better than that! This entry was posted in Still Water Fly Fishing and tagged Bombers, chironomid fishing in the summer, Chironomids, fly fishing, Hatheume, hatheume lake, hatheume lake fishing report, hatheume lake fishing reports, John Kent, Late Summer, latest fishing report hatheume lake, Leighton, Minnie, Stoney, Tunkwa, Tunkwa lake, tunkwa lake fly fishing. Bookmark the permalink.